Over the past two decades, Oklahoma’s Quality Jobs Program has paid out $949 million in taxpayer funds to companies that said they would create as many as 235,841 new jobs for state residents. An Oklahoma Watch data analysis shows that the number of jobs actually created fell far below initial projections. Fewer than half of the jobs projected materialized by the required deadline and qualified for subsidies. The analysis also shows that state spending on the program has grown more than three times as fast as the tax revenues that support it. Oil and gas firms were initially excluded from the program, but now account for about half of all payouts. State officials note that the overoptimistic projections did not increase the program’s cost. Companies generally only get paid for jobs they actually create. But the erroneous estimates may have created false impressions about the scope and success of the Quality Jobs Program, often characterized as the crown jewel of the state’s job-incentive initiatives. State officials trumpet the estimates every month, but make no announcements when companies drop out or fall short of their estimates. Mark Lash, a retired federal program manager and analyst who contributed to the Oklahoma Watch review of the Quality Jobs Program, said the overestimates are troubling. Oklahoma Commerce Department Interim Director Don Hackler acknowledged in an interview that the official job projections were based on “best-case scenarios” that sometimes didn’t pan out. Created in 1993, Quality Jobs provides cash payments to manufacturers and other businesses that create jobs in Oklahoma by opening new operations or expanding existing ones. In most cases, payments are equal to about 5 percent of total payroll expenses for the qualifying jobs, which must pay a specified minimum dollar amount and must include health insurance. Companies submit applications to the Commerce Department, which decides who qualifies and awards the contracts. The program paid out $78 million during fiscal year 2014. State officials contend the program is “revenue neutral.” They say the cost of the subsidies is offset by additional tax revenue generated by the people who get the jobs. Economists who have studied the program say that assertion is difficult to prove. Among other things, it assumes the jobs would not exist if the companies had not received Quality Jobs incentives. “Just because a job is counted as being supported by the program doesn’t mean it was created because of the program,” said Mickey Hepner, dean of the University of Central Oklahoma College of Business. • The number of jobs “incentivized” is 84,899, or 36 percent of initial estimates, based on the most recent data for each contract through June 30, 2014. • The state has paid about $11,000 over time for each job created. 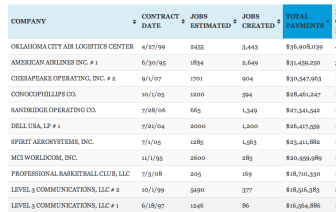 Some jobs lasted the 10-year period covered by most contracts; others were short-lived. • For every firm that successfully completed a contract, about three were terminated or voluntarily withdrew. • About 5 percent of last year’s payouts went to the partnership that owns the Oklahoma City Thunder, which ranks as the program’s ninth-biggest recipient. • The state regularly announces how many jobs “will be created” under new contracts, but does not routinely report actual job creation data. • The state has only three people assigned full-time to monitor the program, and has done no comprehensive analysis of job creation or retention. The Oklahoma Watch study is based on data provided on request by the Oklahoma Tax Commission, which makes the quarterly payments to participants. For active contracts, the number of jobs created is the number of qualifying jobs identified in each company’s most recent claim as of June 30, 2014. For non-active contracts, the jobs-created figure is based on employment during the last quarter for which a payment was made. The Commerce Department approved 735 contracts during the program’s first 21 years. But some of those were additional contracts for companies already enrolled in the program. The total number of companies is about 600. Contract recipients are almost all private sector employers such as American Airlines, Chesapeake Energy Corp. and Dell Inc., which are among the top recipients. One notable exception is the Oklahoma City Air Logistics Complex at Tinker Air Force Base, the top recipient. The federally owned complex qualified for the program as part of a project in which it teamed up with Lockheed Martin Corp. to do engine maintenance for Air Force planes. The Oklahoma City Air Logistics Complex is the top recipient of Quality Jobs Program payouts, at $37 million. 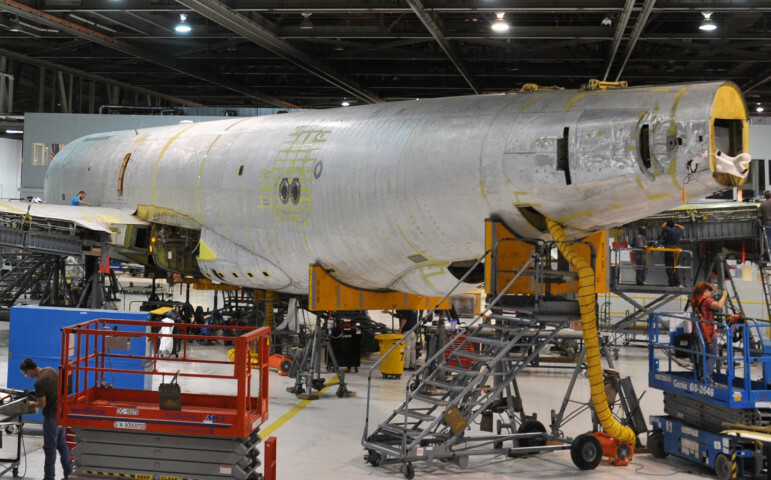 In this photo, members of the complex work on the KC-135 line. The analysis excludes three small subsidiary programs created in recent years: the Small Employer Quality Jobs Program, the 21st Century Quality Jobs Program and the Prime Contractor Program. Together, they paid out $4 million last year and $18 million since their creation. The Commerce Department chooses the companies that participate in all four Quality Jobs programs and negotiates the contracts. Documents submitted by the companies and records justifying the department’s decisions are kept confidential. Hackler said the state’s Open Records Act prohibits the department from releasing proprietary information about a company’s business plans, feasibility studies, financing proposals and other information. Hackler said he has no reason to doubt the accuracy of the Oklahoma Watch analysis. He said the Commerce Department has not attempted to do a similar study because state officials never asked it to do so. The Quality Jobs Program has many defenders. They describe it as the best incentive ever devised by the state to generate new employment and ensure tax dollars are not wasted on nonproductive projects. The program is often cited as a model for other states looking for accountable and cost-efficient incentives. State Senate Finance Committee Chairman Mike Mazzei, R-Tulsa, said he, too, believes the Quality Jobs Program is a more effective and accountable incentive than many of the tax credits provided to businesses. He also likes the fact it is time-limited: Except for the Oklahoma City Thunder, which can keep receiving payments for 15 years, employers are limited to 10 years of benefits. Mazzei said the program has helped recruit several big projects to Oklahoma in recent years. They include a Macy’s Inc. distribution center expected to employ at least 2,500 people near Owasso, and a planned GE Global Research Center that will hire an estimated 130 high-tech professionals in Oklahoma City. When the program was designed in 1993, it was more limited in scope because it focused mainly on manufacturing industries. Over the years, other employer categories were added: cargo haulers, grocery wholesalers, oil and gas extractors, collection services, professional organizations and professional basketball franchises. The Thunder franchise was added in 2008 as part of a package of incentives designed to lure the Seattle SuperSonics to Oklahoma City. Unlike other Quality Jobs participants, it will receive incentives for up to 15 years instead of 10. The team’s owners received $4 million in wage subsidies last year and a total of $19 million since joining the program. The program’s ground rules are fairly simple. Participants must agree to pay their new workers either the average wage for the county in which they are located or a statewide average, whichever is lower. The statewide average is currently $31,684. Companies must provide their employees with health insurance. They are given three years to attain a minimum annual payroll of $2.5 million for the jobs created. If they fall below that level, they drop out of the program. While subsidies are pegged to actual jobs created, the state has at times paid for jobs that were later eliminated by downsizings and plant closings. So far, no employers have been required to repay what they received. A 2012 investigation by News9 identified numerous examples of companies that received Quality Jobs payments for employees who were eventually laid off. One was glass manufacturer Zeledyne LLC, which acquired a Tulsa windshield plant from Ford Motor Co. in 2008. It received $2 million in Quality Jobs payments over three years. But in 2011, it closed the plant and laid off several hundred workers. Zeledyne was not required to repay any of the incentives because paybacks had never been required under the program. In 2013, the legislature added a limited “clawback” provision to require repayment if companies do not maintain a presence in Oklahoma for at least three years after entering a contract. So far, the provision has never been invoked. The Oklahoma Watch analysis shows that far more companies drop out of the program than complete it successfully. Among 526 non-active contracts, just over a quarter were completed. They include 101 that reached the end of the 10-year maximum contract term and 41 that received the maximum allowed benefits before the 10 years expired. A total of 384 contracts were dropouts. Reasons included voluntary withdrawal or removal from the program, failing to reach the minimum annual payroll threshold of $2.5 million, and not filing a claim within three years. The dropout roster includes companies such as auto part manufacturer Affinia Products Corp.
Affinia received its Quality Jobs contract in 2007. At the time, it planned to consolidate its Oklahoma and Indiana operations in Oklahoma City. It estimated it would create 224 jobs qualifying for the Oklahoma incentive program. Over the next six years, Affinia received $899,846 in Quality Jobs payments. The number of qualifying new jobs peaked at 124 in late 2009. The number dropped to 63 by the first quarter of 2013, according to Affinia’s most recent claim. In May 2014, Affinia sold its Oklahoma operations to Federal-Mogul Corp. In November, Federal-Mogul announced that it planned to close its Oklahoma City plant sometime in 2015, eliminating all jobs there. Every month, the Commerce Department issues a press release announcing how many jobs “will be created” by new Quality Jobs contracts approved that month. For example, the department announced in June 2002 that it had approved four Quality Jobs contracts that month covering a total of 1,396 jobs. Celestica Inc., an electronics manufacturer, qualified for subsidies for 800 jobs in Oklahoma City. Center Partners Inc. estimated it would create 425 jobs at its Yukon call center. Sagebrush Pipeline Equipment Co. estimated it would add 81 jobs in Sapulpa, and Inalfa Roof Systems projected 90 qualifying jobs in Oklahoma City. All four companies eventually dropped out of the program. At the time they received their final subsidy payments, their combined qualifying job count was 128, less than 10 percent of their original estimates. Before they dropped out, the four companies received $3.3 million in Quality Jobs payments. The biggest recipient by far was Celestica, which received $3.1 million. But most of those payments were for existing jobs, not new ones. Celestica qualified for the program after it bought the Oklahoma City operations of Lucent Technologies Inc. in 2001. Celestica said most of the jobs covered by the Quality Jobs contract were existing positions. The Commerce Department said the company qualified for the program because those employees needed extensive retraining. In its published descriptions of the Quality Jobs program, the Commerce Department states how many contracts have been approved over time and total payments made. But it provides no overall tallies of jobs promised or jobs actually created. Once every three years, the department prepares a detailed report on the program for the legislature. It includes a section showing how many jobs qualified for subsidies during each of the 12 quarters included in the report. But it provides no summary tallies. “We don’t have hard data or nice spreadsheets to say, ‘Here’s the life history of all 700-plus companies we’ve dealt with,’” said Interim Director Hackler. Hackler cited several reasons why companies often fail to hit their employment targets. Among them: government contracts that fail to materialize on schedule, unexpected economic downturns and industry-specific slumps. such as the recent decline in crude oil prices. In addition, he acknowledged that companies have a built-in incentive to overestimate potential job creation. Since total contract payments are based on initial job estimates, a company that underestimates will not get paid for any additional jobs it winds up adding. The program contains no penalties for overestimating. Hackler said the Commerce Department does its best to make sure each company’s job estimates are realistic. But with only two Commerce Department employees assigned to the program full-time, it can be a challenge, he said. The Tax Commission, which processes the claims and handles the payments, has only one employee assigned full-time to Quality Jobs. “They’re stretched at times,” Hackler said. State House and Senate leaders have introduced proposals to require thorough reviews every four years of various business incentives, including the Quality Jobs Program, that are costing the state as much as $300 million annually.